February 25, 2015 at 2:00 pm EDT | by Lou Chibbaro Jr. The sometimes unrecognized love for LGBT people within black families and the growing number of young LGBT leaders who are black emerged as themes in the final week of the D.C.-area celebration of Black History Month, according to an official with the National Black Justice Coalition. Among those appearing at the event were gay former NBA player Jason Collins and E.J. Johnson, son of famed NBA star Magic Johnson. “There is a dominant and pervasive narrative within the U.S. and internationally that the black community is overwhelmingly more homophobic than other groups, but we know that this biased assumption is unfounded,” a statement released by the campaign says. Wilson said NBJC planned to release toward the end of the week a list of “100 Emerging Black LGBTQ Leaders Under Age 30” to show that an emerging generation of black LGBT leaders in many different fields and professions are becoming involved in civic affairs, including LGBT rights. 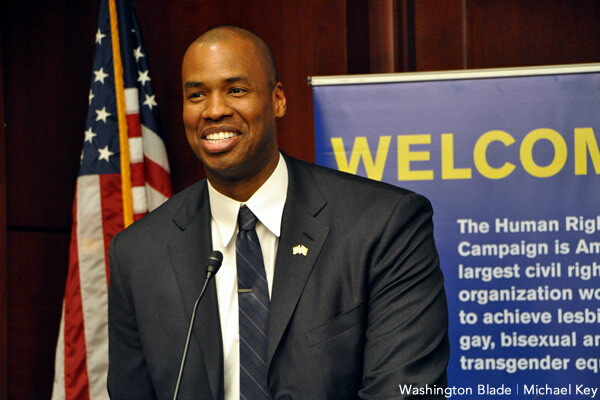 Although he knew of no additional LGBT specific Black History Month activities this week in the D.C. area, Wilson said many of these events would be of interest to LGBT community members: http://culturecapital.com/feature/132/black-history-month-february-2015-in-metro-dc.